Our certiﬁed mold remediators do it by the book. 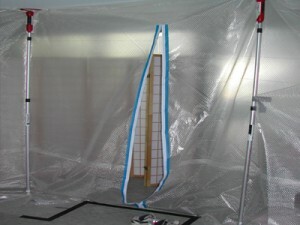 We cut no corners, yet we are very reasonable and affordable compared to most mold remediation companies. We have low overhead so we usually can be 30 to 50 percent below the bigger companies. But lower price does NOT mean lower quality. 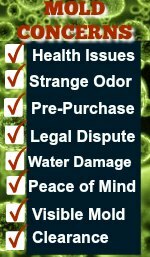 We are certiﬁed in all areas of mold. This means we never cut corners, we do the same thing and use the same profession equipment that the bigger companies do. Again, to be clear, with us: Lower price does NOT mean lower quality. We also provide extensive before and after photos of every job we do. We set up containment around the affected area and use commercial air scrubbers and commercial hepa vacuums. We set up negative air pressure to insure that the mold in the affected area is contained and does not contaminate the rest of your house. General Contractors do not have the training nor the specialized equipment to protect your family while the mold removal is going on. It is one thing to try to get the bids for the lowest price for remediation. It is another to hire a company that sacriﬁces quality service that could endanger the health of the occupants. Whoever you hire, make sure they are mold certiﬁed and do work by the book, never cutting corners. We have unintentionally become the gentlemen of the industry. Customer Service is a big priority with us. Our customers tell us almost always how much they appreciate our close personal interest in their situation. They can tell it is not just a job to us, but we really care. It is not just about the money. We often go above and beyond the original agreement when it comes to doing any extra things that come up later that need to be addressed. We offer our suggestions and answer any questions to your complete satisfaction, even months or years down the road! It is not uncommon for us to get emails months later thanking us again for helping to return their home to a clean environment. You invite strangers into your home when you hire a mold removal company. You never know how that experience is going to be and it can be a cause for further anxiety. But you can rest assured of this one thing above all other things about our company: We may walk in as strangers, but only for a few minutes. You will almost immediately feel the love, care and concern we have for you and your family and the situation with your home. It just gets better from there. There is a reason why we, as a small family owned company, just naturally care so much. Please read our personal story on the “About Us” page. Call us with any questions you may have. Or, if you feel more comfortable texting, feel free to text for an immediate answer from a local professional. 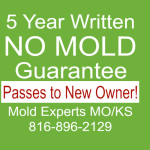 Call or Text your questions anytime 24/7 to our Mold Guru: (816) 896-2129. 1) We offer a Written 5 Yr “No Mold” Guarantee (to our knowledge no other company offers anything close to this). 2) Customer Service Unlike Any Other Company, Period! 3) Our Prices are usually 30% to 50% lower than the bigger Franchise Mold Companies. 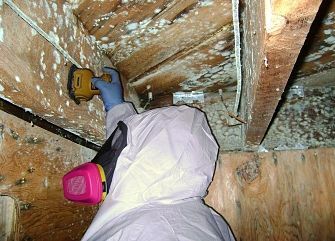 4) Free Estimates on Mold Removal. 5) We are Certiﬁed in all areas of Mold. 6) Lower price does NOT mean lower quality. 7) We are a member of the Better Business Bureau. We did not seek the BBB out, but they called us and said we have never had a complaint registered against us and they wanted us to be a member. 8) Banks, Mortgage and Real Estate Companies use us because they can Trust us. 9) It’s personal. One of our children has been permanently affected by poor indoor air quality. We care about your family as if it was our own. 10)We care. Those are not just words. We REALLY Care.